Meet Shawn Webster, the artisan whose pinpoint attention to detail lands him at the top of the Native American art form's class. Shawn Webster’s attention to detail as an artisan shines in his work. Shawn is a man of many talents. 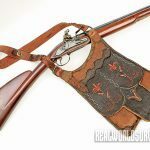 He made both the shooting bag and the 20-gauge Fusil de Chasse. Shawn takes a break during a reenactment. These beautifully quilled neck sheaths provide homes for a pair of Glen Mock’s hand-crafted knives. 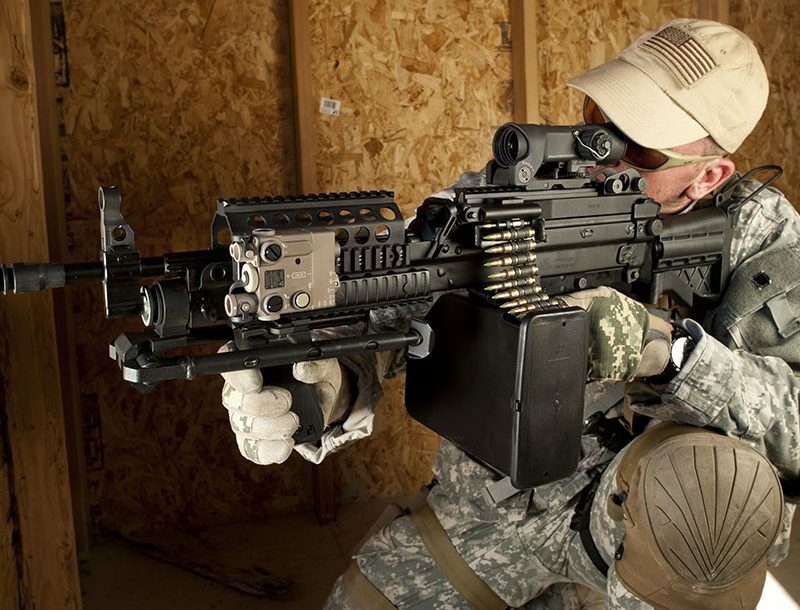 Learn more about Glen Mock at longrifle.com/artisans. 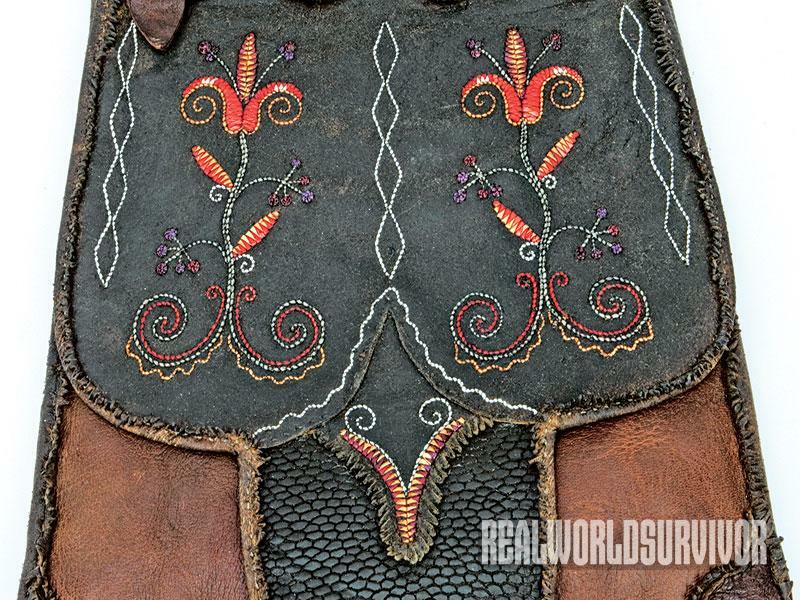 This beautiful shooting bag is handcrafted from bark-tanned mule deer hide and decorated with Metis-style quillwork. 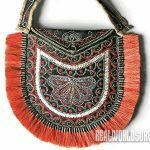 A quill-embroidered panel of brain-tanned buckskin makes this hunting bag something truly special. Quill work, which is embroidery done with dyed porcupine quills instead of with thread, was a decorative art developed by Native Americans. Shawn made the beavertail on the hunting pouch from a real tanned beaver’s tail. 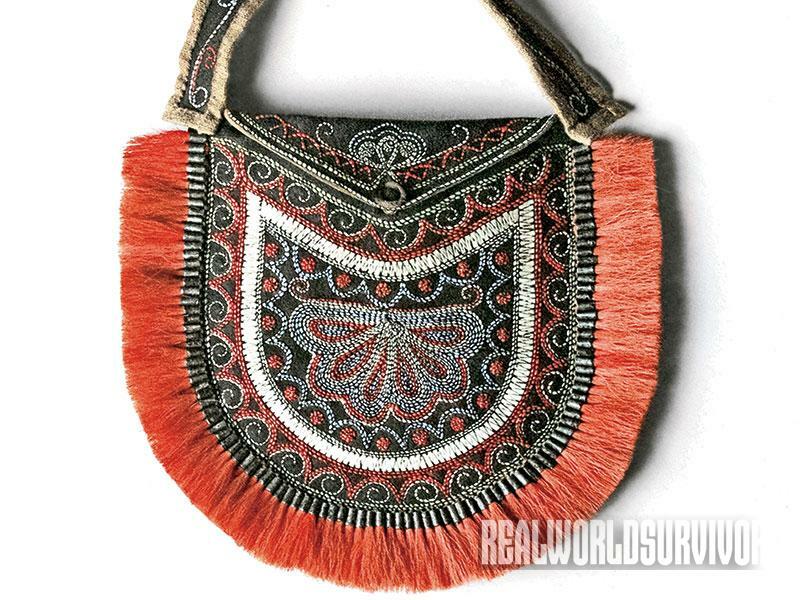 This Huron-style bag is a reproduction of a bag made in 1829. This detail from the Huron bag shows a variety of quilling techniques, with masses of single-quill loops set off by an outline of white zig- zag quills. 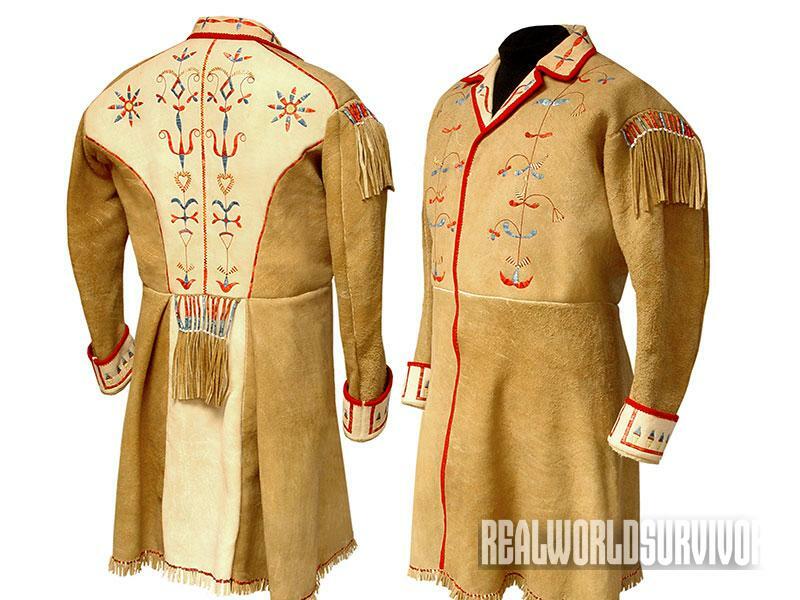 The Metis coat is one of Shawn’s most famous designs. It is made of two-tone elk skins. Shawn achieved the two-tone effect by smoking the hides over different kinds of wood. 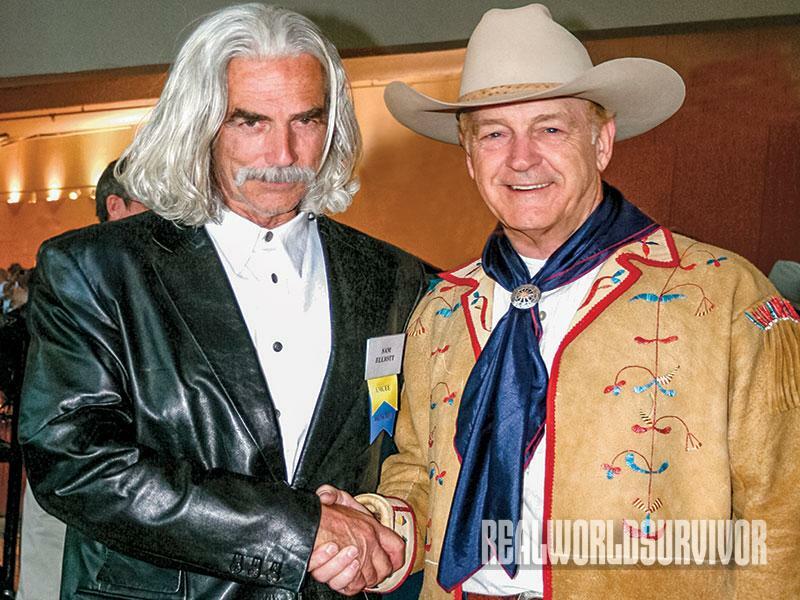 Sam Elliott with artist David Wright at the Western Heritage Awards. Wright, wearing the Metis coat crafted by Shawn Webster, was there because he art directed the documentary Daniel Boone and the Western Movement produced by Native Sun Productions, which won Best Documentary. 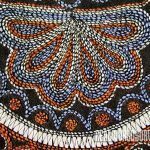 A lot of people think of beadwork as being the quintessential Native American decorative art, but long before Europeans brought glass beads to these shores, tribal artists were crafting beautifully decorated clothing and objects. The media they worked with for hundreds of years were porcupine quills. Using these stiff, hollow hairs, native quill workers created a dazzling variety of designs. When glass seed beads became widely available in the 18th and 19th centuries, quill workers largely switched to the new medium because the working techniques were similar, but beads were less grueling to work with. And clothing and objects decorated with beads were easier to take care of than those embroidered with quills. 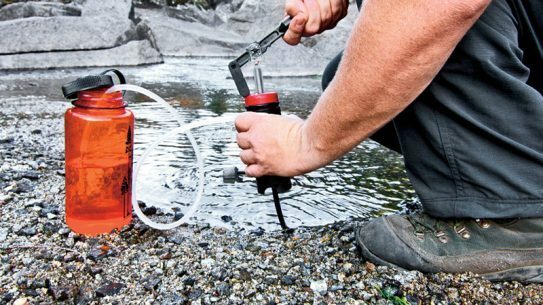 In some areas, however, the traditional methods stayed in use. The Micmac and the Chippewa tribes in particular held fast to the traditional medium. Today, there is something of a revival of porcupine quill embroidery thanks to reenactors and living historians. 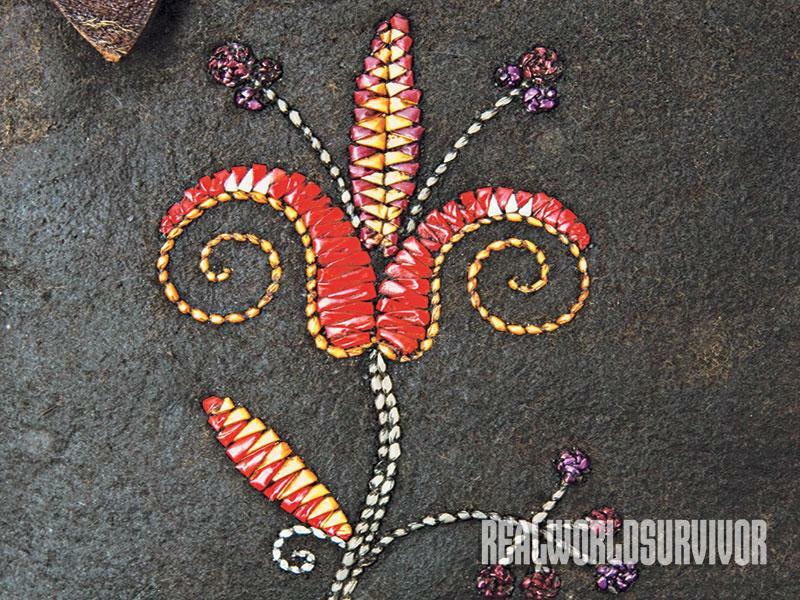 Shawn Webster is one of the modern masters of porcupine quill embroidery. The quillwork Shawn is doing today rivals the finest work by native artists in the 18th century. 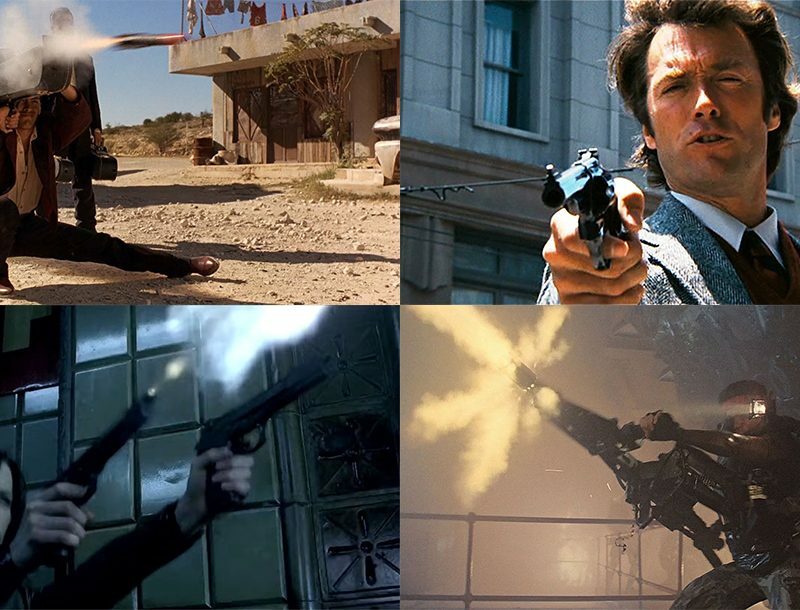 Shawn got started in his craft the same way a lot of us did. As a young man, he attended a rendezvous and saw a quill-embroidered item for sale. He liked the piece, but he couldn’t afford the $50 price tag. So, naturally, Shawn decided to learn how to make one himself. 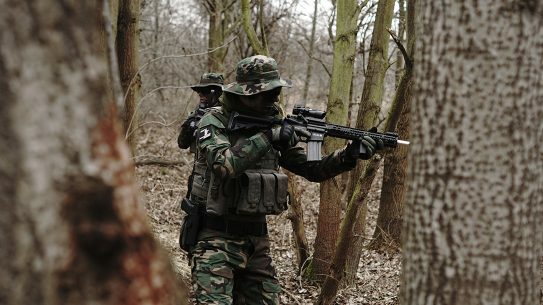 I can’t tell you how many pieces of gear there are in my kit that I made for the same reason. The difference is, for Shawn, it became his life’s work. Shawn’s interest in Native American crafts grew out of his work. For five years, Shawn taught high desert survival at the University of Southern Utah. 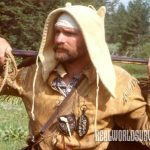 He thought that Native Americans, and the frontiersmen who learned from them, were the best survivalists who ever lived. 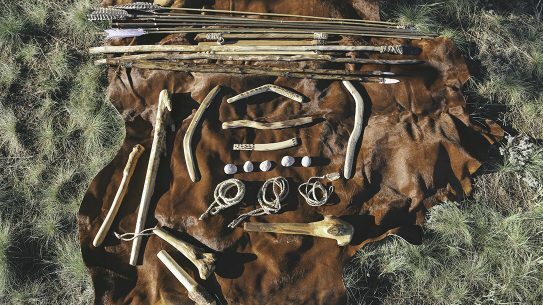 He wanted to learn their skills and recreate their way of life in the wilderness. quill working. Shawn is entirely self-taught, and he had a lot to learn. Quilling is a much more complex process than bead-work embroidery. 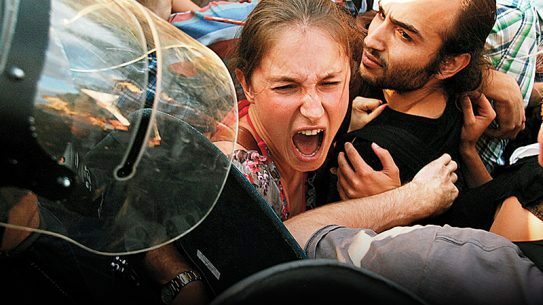 First there is the matter of the quills themselves. Not all porcupine quills are suitable for quillwork. 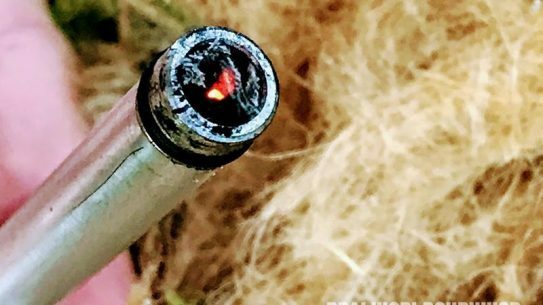 Quills that work well are 2 to 3 inches long. Before dying, the quills are an off white color with black tips. The tip of the quill is where the barb is. This has to be snipped off before the quill can be used. But before cutting off the barbs, the quills are usually dyed. natural dyes that he prepares himself. 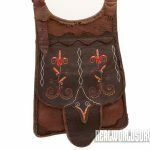 It isn’t easy, but the effort is worth it for the results, because dyed quillwork adds vibrant color to leather items that would look quite bland otherwise. Before they can be used, the quills have to be soaked to make them pliable, and then they have to be flattened. As Shawn learned, there is no point in pre-soaking too many quills because, if they dry out before you use them, every one of them will have to be soaked all over again. 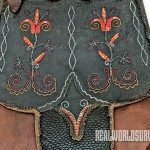 When he started as a quiller, Shawn was trying to recreate the quillwork he was seeing at rendezvous, but a chance meeting in 1985 changed everything. 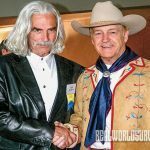 Shawn was horse-back riding to an American Mountain Men rendezvous in Wyoming when he met up with David Wright, who was also riding into the rendezvous. They struck up a strong friendship on the trail that has lasted for three decades. David Wright is a world-class artist who is best known for his depictions of the early American frontier. He is also a top-notch photographer who has developed an extensive photographic collection documenting Native American objects. After the rendezvous, David sent Shawn 500 photographic slides, all high-quality images of original Native American quillwork. By studying those slides closely, Shawn was able to raise his art to the next level. 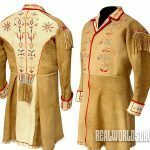 I first encountered Shawn’s quillwork years ago, when I saw a picture in a magazine of one of his most famous designs, the Metis coat. Today, the word “metis,” with a small “m,” is the accepted word in Canada for people of mixed Native American and European ancestry. When the “M” is capitalized in Metis, it refers to a government-recognized, indigenous cultural group, or a tribe if you will, that evolved out of generations of metis people. From the earliest days of Canada, the French fur traders and voyageurs intermarried with native women. Their children often identified culturally with their mothers’ tribes, and many of these metis offspring followed their fathers into the fur trade. 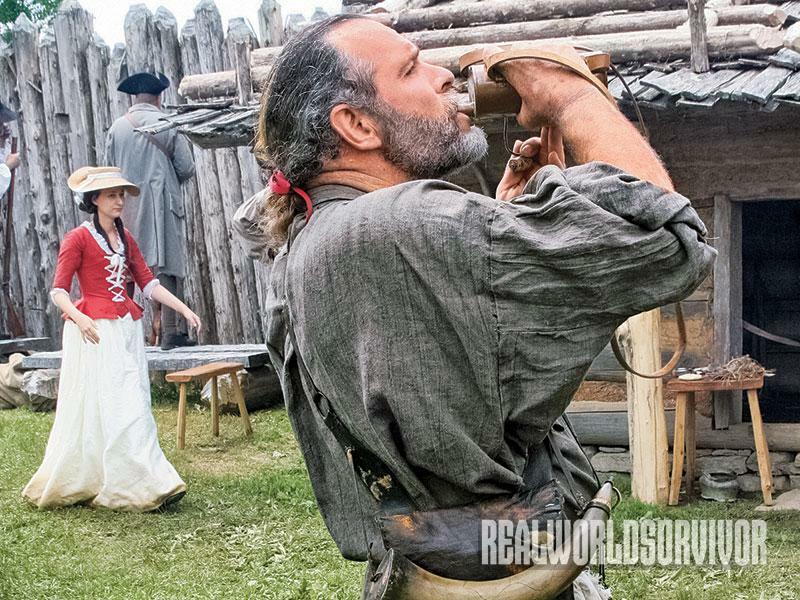 In the early and mid-19th century, as the Hudson’s Bay Company and the Northwest Company’s fur-trading operations pushed across Canada’s western plains, metis employees formed the experienced back-bone of the trade. By then, most metis children had been born to families where both parents were of metis ancestry. They no longer identified with their grandmothers’ tribes and the Metis culture began in earnest. Shawn’s Metis coat reflects the melding ried with native women. Their children of cultures that created the Metis. The coat is closely tailored, with cuffs and lapels, like European counterparts. But it is made of two-tone, brain-tanned elk hide. The coat is made of three cow elk skins. 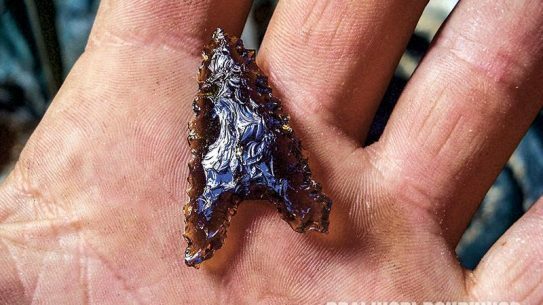 Shawn smoked the darker hides in a cottonwood fire. The lighter colored panels were smoked with willow wood to impart a creamy color. The decorations on Shawn’s Metis coat replicate the actual quillwork on a Sioux Metis coat that is on display in the Denver Art Museum. 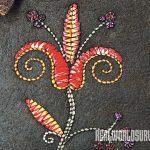 The Metis coat is decorated with graceful quillwork in a combination of floral and geometric designs that combine the zigzag quilling technique with single-line quill embroidery. All of the leather fringes on the coat are wrapped together in pairs by quillwork bands. All the coat’s quills are beautifully dyed in hues of red, yellow and blue. Those colors, and all the colors that Shawn uses, are the result of 35 years of experimentation with different plants and minerals to create the colors, and then many more hours of trial and error to find the right mordant for each color to ensure permanent color saturation on the quill. Shawn said it took him 17 years to get a really good handle on natural dyes and mordants. 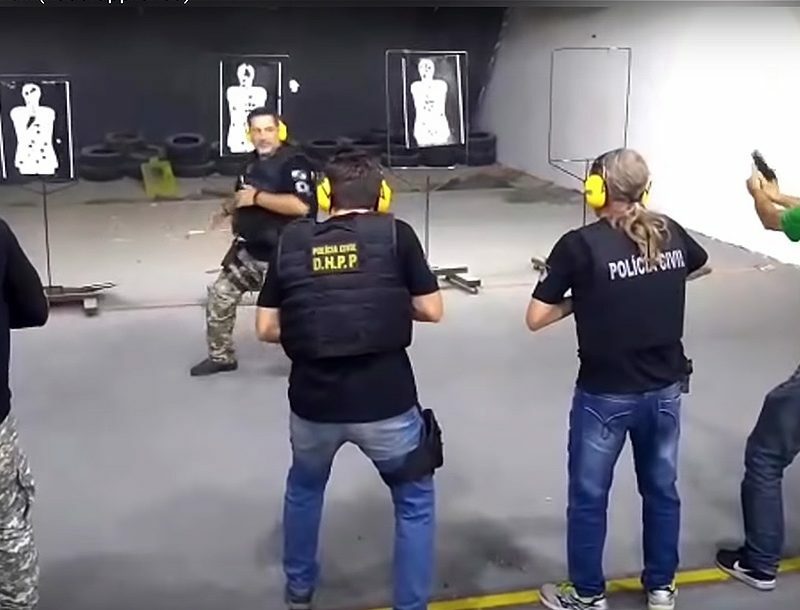 And even after 35 years, he is still learning. He may still be learning, but there is no doubt that Shawn is already a master at his craft. One of Shawn’s quill-decorated bags replicates a bag in the Ottawa Museum of Civilization. This Huron-made masterpiece dates to 1829. Shawn’s version is eye-popping. The predominant color is a vibrant orange. There is orange quillwork and a really stunning orange border made of dyed deer tail hair secured in tin cones. Shawn handmade all 110 tin cones. 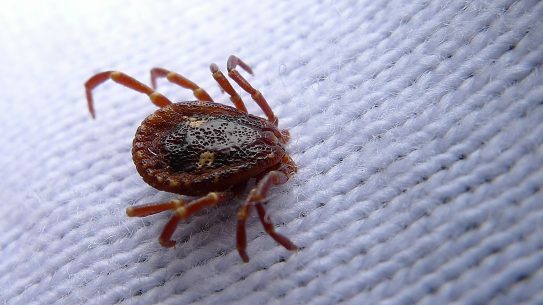 He achieves the bold orange color by dying the deer hair and quills in a combination of ground cochineal beetles mixed with Osage orange wood dust. The delicate, blue-colored quills were dyed with indigo. may be true because Huron women picked up their designs from Ursuline Sisters, who were sent from France as missionaries. The native women translated the work done by the nuns in silk thread to designs of their own, embroidered with quills. 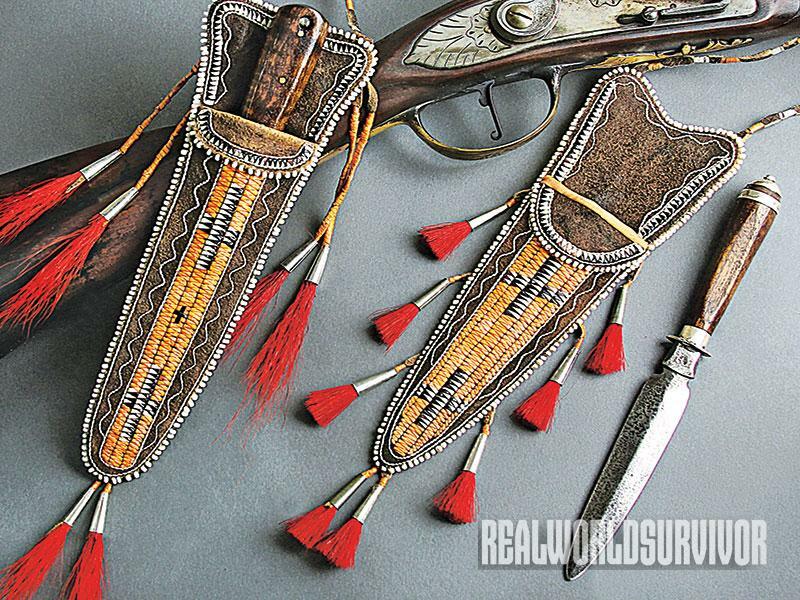 Along with bags, knife sheaths are also excellent vehicles for quillwork decoration. 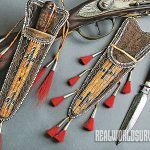 Shawn crafts some that will knock your socks off, as is evidenced by the pair of quill-work neck sheaths pictured that were made for a couple of Glen Mock’s custom knives. Shawn has been doing commercial quill-work since 1980, and, if you do anything for that long, it can get old. 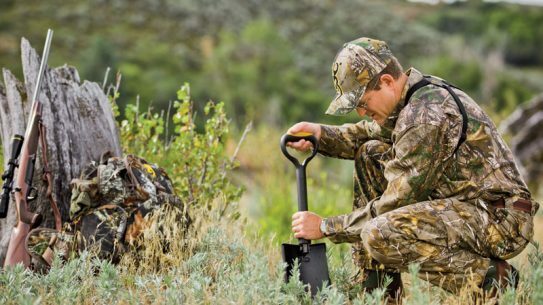 But Shawn avoided burnout by becoming a muzzleloading gun maker. Now, when he needs a break from quillworking, Shawn turns his hands to crafting a fine long rifle or trade gun. A couple of years ago, I managed to pick up a nice flint- lock, 20-gauge, French Fusil de Chasse made by Shawn. It has become my go-to field gun. 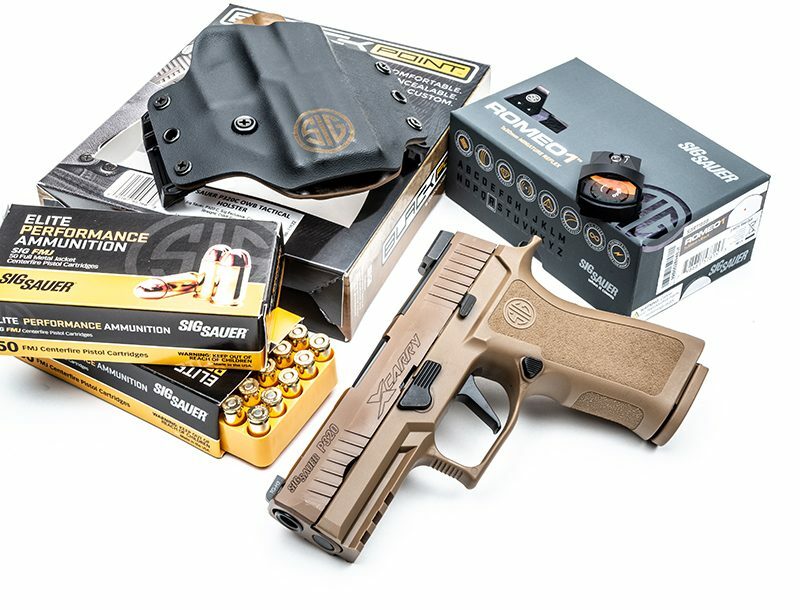 It shoots either ball or shot with equal felicity, and it is an accurate, hard-hitting hunting gun. 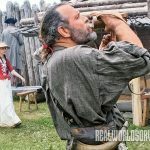 As I write this, Shawn is building a .45-caliber, flintlock long rifle that I’ll use for competitive shooting at 18th century events and rendezvous. When it arrives, I’ll share it with you in an article. This winter, I was lucky to get my hands on a shooting bag built by Shawn. This bag is as functional as it is beautiful. It is a generous 10 inches wide by 12 inches tall. The roomy main chamber is lined with aged pillow ticking fabric. 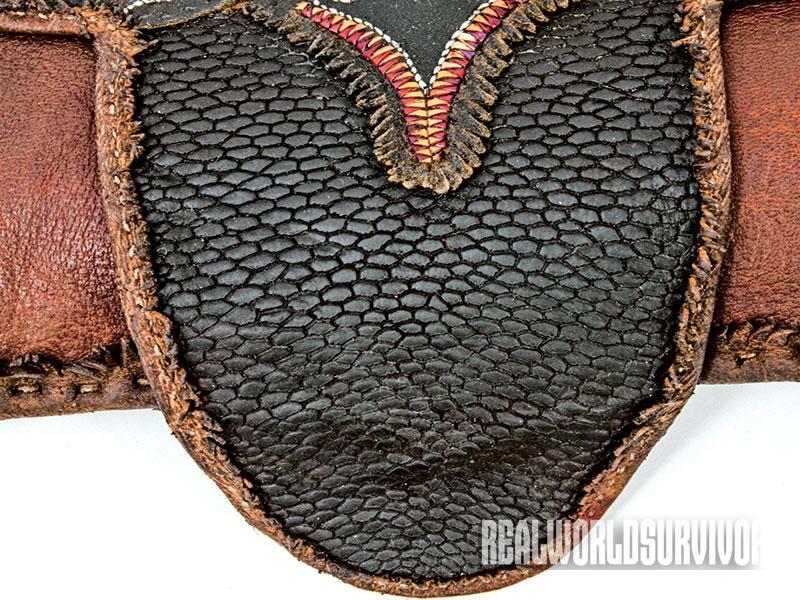 There is a small pouch sewn high up on the back of the main pocket for small items like spare flints. 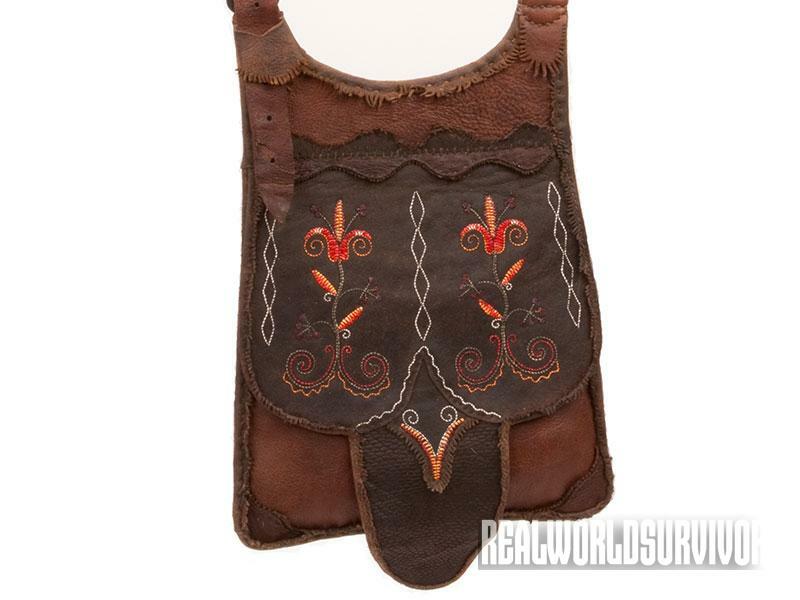 The bag is constructed of bark-tanned mule deer hide dyed a medium brown. 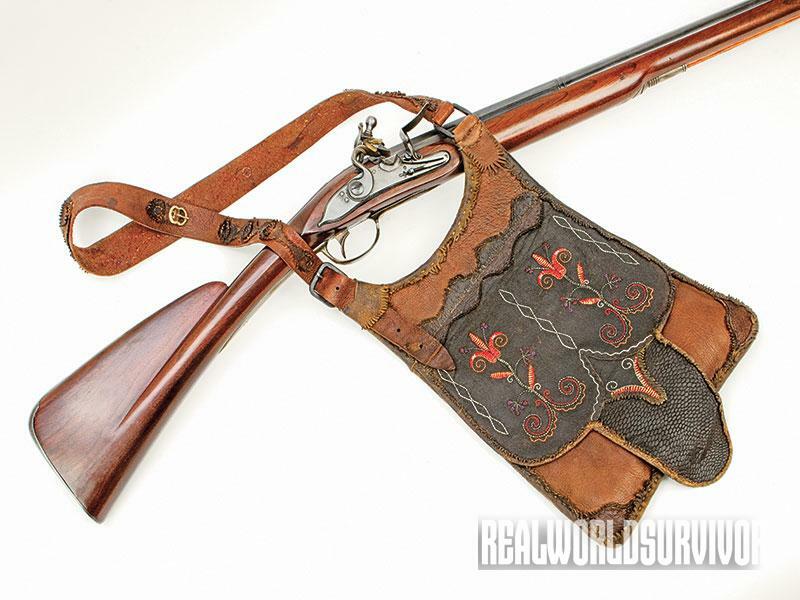 The flap of the bag ends in an oval shape that is called a beavertail. In the case of Shawn’s bag, that term is very appropriate because he actually used the tanned skin of a beavertail to make it. 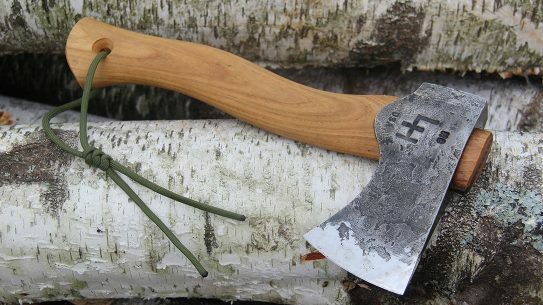 The beavertail leather has a very attractive and unique texture. 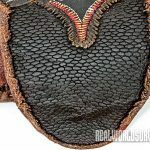 The main panel of the bag’s flap is a square piece of brain-tanned mule deer hide that has been stained a deep chocolate brown. On this panel Shawn embroidered a floral quillwork design. 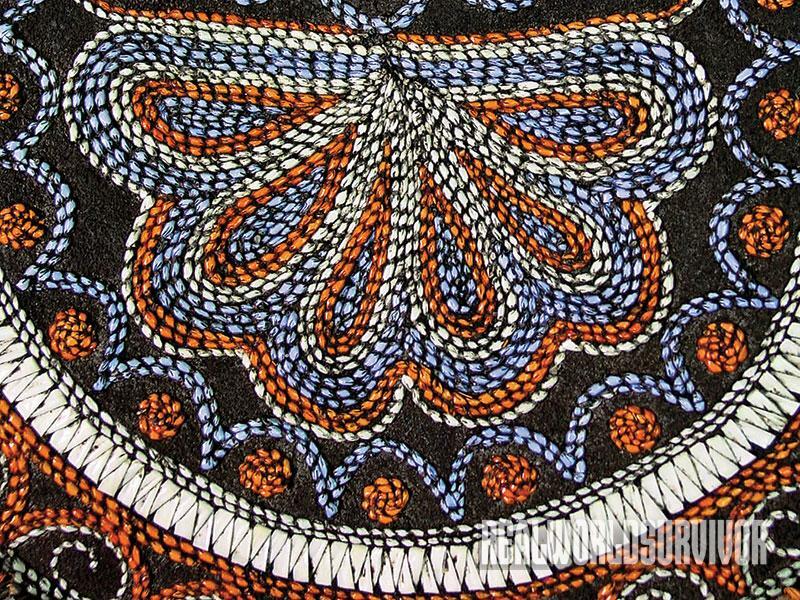 This is an original design of Shawn’s that combines Metis quillwork techniques with Pennsylvania Dutch folk art design influences. This is a beautiful piece of work. There is so much fine detail that I had to use a powerful magnifying glass to see it all. Without a doubt, this is the most beautiful hunting bag I’ve ever held in my hands, and I wish I could say that it would be mine forever. Unfortunately, that’s not the case. The next stop for this bag is Lord Nelson’s Gallery in Gettysburg, Pennsylvania. Lord Nelson’s Gallery is the country’s largest exhibitor of art related to the French and Indian War period done by the best contemporary artists in the country. Along with art, Lord Nelson’s also has an impressive collection of fine period accouterments. So, if you’re in Gettysburg this summer, you might get the chance to own the bag I covet. If you do get it, please don’t call me to rub it in. 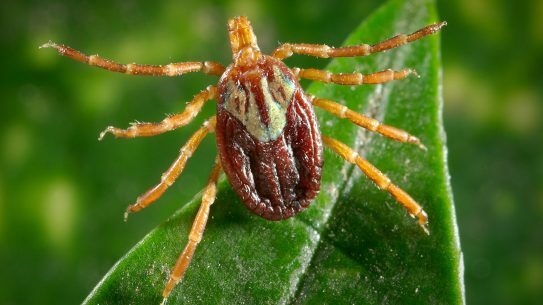 I already feel bad enough about giving it up. 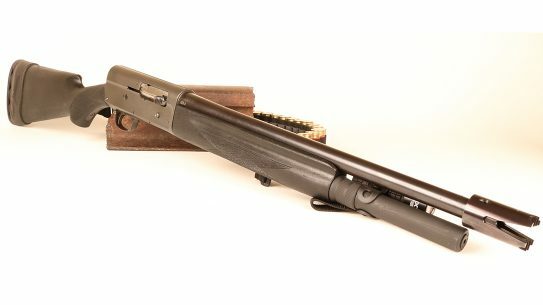 For more on Shawn’s work, visit websterquillandgunworks.com. 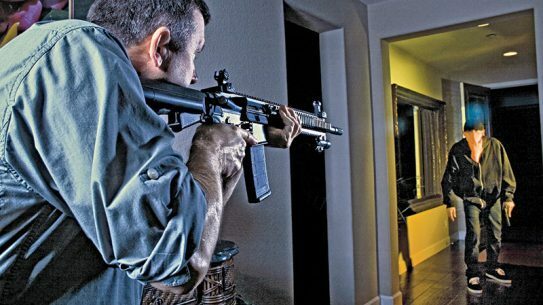 Editor’s note: This is not the first time Shawn Webster has appeared in American Frontiersman magazine. 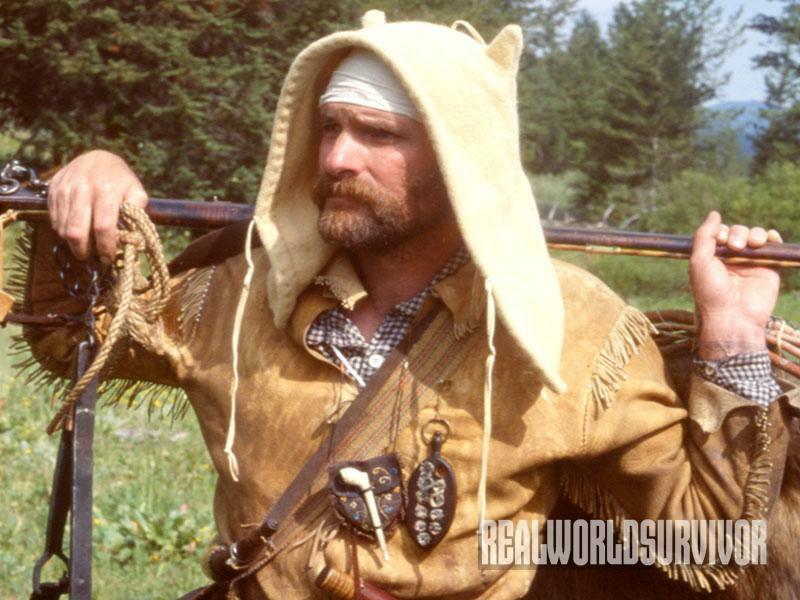 In fact, Shawn was the cover “mountain man” model (issue #191) for artist David Wright. Be on the lookout for more great pieces of art—from both men—in future issues. To purchase back issues of AF magazine, e-mail backissues@harris-pub.com or call 212-462-9525. 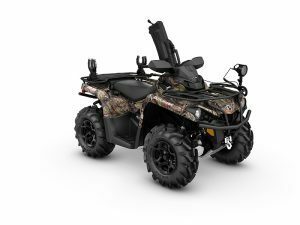 The new outlander features several upgrades made with the modern hunter in mind.